Have you ever stepped outside after a rain storm to see a rainbow? There’s something majestic about the arch of brilliant colors streaming across the sky. It’s worth taking in the beauty for a few moments before it fades away. The story of rainbows began after the judgment of God when the entire world was covered in a flood. Every living person and animal died except Noah, his family, and the animals on the ark. Afterwards God made a promise to never destroy the entire human race or animals with a flood disaster. “And God said, ‘This is the sign of the covenant I am making between me and you and every living creature with you, a covenant for all generations to come: I have set my rainbow in the clouds, and it will be the sign of the covenant between me and the earth’” (Genesis 9:12-13). While many people find it difficult to keep their promises, God is above man and He always keeps His promises. The rainbow covenant is just one of the many promises He makes. God promises to never leave nor forsake us. He will meet all of our needs according to His riches and glory. The Lord answers all of our prayers according to His will. Believers can take great confidence in knowing that God’s promises are steadfast and secure. “Whenever I bring clouds over the earth and the rainbow appears in the clouds, I will remember my covenant between me and you and all living creatures of every kind. Never again will the waters become a flood to destroy all life” (Genesis 9:14-15). God never forgets His promises even when we forget. He remembered Abraham and brought Lot out from being killed. He remembered Rachel and Hannah by blessing them to conceive children. The Lord remembered Israel’s sufferings and brought them out of slavery. In the end times, the Lord will remember the great sins of Babylon and punish the nation. We may sometimes feel that the Lord has forgotten our prayers. However, every time we see a rainbow—we are reminded that He never forgets. … every time we see a rainbow—we are reminded that He [God] never forgets. “Whenever the rainbow appears in the clouds, I will see it and remember the everlasting covenant between God and all living creatures of every kind on the earth. So God said to Noah, ‘This is the sign of the covenant I have established between me and all life on the earth.’” (Genesis 9:16-17). Every time a rainbow shines in the world—it’s a witness of His promise. A promise is made stronger with a symbol (like a handshake) and/or made in the presence of many witnesses. This gives more credence to both parties that the promise will be kept. God established the book of the law as a witness between Himself and Israel. Jesus is the faithful and true witness who fulfilled the covenant of God to redeem mankind. His promises are profound because God knows the big picture (especially when we fail to keep our promises to Him) and still stands by His word. “Like the appearance of a rainbow in the clouds on a rainy day, so was the radiance around him” (Ezekiel 1:28). “Then I saw another mighty angel coming down from heaven. He was robed in a cloud, with a rainbow above his head; his face was like the sun, and his legs were like fiery pillars” (Revelation 10:1). “And the one who sat there had the appearance of jasper and ruby. A rainbow that shone like an emerald encircled the throne” (Revelation 4:3). Many believers have the impression of heaven being surrounded by pure white light with angelic beings wrapped in a mysterious opaque brilliancy. While that could certainly be true—colorful rainbows will also be a part of heaven. 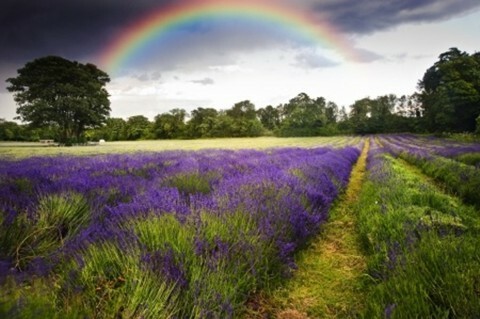 Rainbows are a taste of the beauty we look forward to in our future heavenly dwelling. Even though the rainbow represents God’s promise to us on earth; it also beams with the hope of heaven in our hearts. The ultimate promise God makes to every believer is that their future home is in heaven. The rainbow will remain long after this earth is past. “For no matter how many promises God has made, they are ‘Yes’ in Christ” (2 Corinthians 1:20a). Remember every time you witness a rainbow—know that God will keep His promises to you in spite of hardship, trials, persecution or any other life altering circumstances. He is faithful to keep all His promises to you throughout eternity. God made many promises to Israel in their journey to the Promise Land. At the end of their long 40-year journey, they came to the conclusion that “not one of all the Lord’s good promises to Israel failed; every one was fulfilled” (Joshua 21:45). May that be every believer’s confession as they pass from this world to the next one. Amen!
. I am reminded of 2 daughters time in Rainbow GirlsGodspromise after the flood. Yes! I taught the Rainbow girls many years ago. Awesome experience! I have friends and family from all over that text, email, or tag me in photos on facebook when they see rainbows, and I feel blessed every time. For me, they’re telling me that they remember my daughter, Carys Rainn, who was born and died in 2011. When I see rainbows, I take them as a reminder that God has promised us a Heavenly home… and my baby girl is with Him! I always imagine the splendor of the radiance of God’s glory reflecting off the jewels in the walls of the New Jerusalem. No, I don’t believe Heaven will be stark white. It’s going to be so incredibly beautiful, beyond whatever small glimpse we get here on earth. Love the article! Reading it has definitely be a bright spot in my day. Thank you Keri for sharing that precious insight into how God keeps His promise and how we look forward to one day being reunited with loved ones. Thank you so much for this beautiful piece, Crystal. It’s no wonder why the LGBT community has adopted the rainbow as one its most meaningful symbols. It proves that God is all-inclusive and has a place for everyone in heaven despite race, color, creed, ethnicity, sexual orientation, or gender. What a powerful statement, and what a wonderful place Heaven will be! Amen! I must share an example of God’s promise. A couple days ago I contacted my wife to inquire about her meeting me so I could pick up something that I needed. I asked her to bring it with her, and that we could meet briefly, then she would be on her way. The day came that I was to meet her during the afternoon hours. Beforehand, I spent the morning hours on my knees praying, seeking His counsel. As I did so, time and again, I felt God’s presence through reading His word and devotional. The time came for me to leave to meet with her. It had begun to rain, and the skies were cloudy and dark. With rainwater everywhere, I traveled the 25 miles it would take for me to get there. While driving I prayed that God would give me the words that He would have for me that day. While doing so, I half heartedly (more in a jovial type statement) made a comment to God that, “wouldn’t it be cool if I got there, and as we spoke, the clouds parted and the sun shined, and a rainbow appeared”. Now, I knew this was highly unlikely because rain was everywhere and wasn’t predicted to stop until the next day. So I arrived and sure enough the rain was coming down and it was still dark and cloudy. After a short while she arrived and we sat in my truck as to not get wet. We exchanged the needed items and then began to speak of trivial small talk in an attempt to catch up because we had not physically seen each other in numerous weeks. As I spoke, I just happened to look out the window and I noticed the CLOUDS HAD PARTED, THE SUN HAD BEGUN TO SHINE, AND A RAINBOW WAS EXHIBITING ITS GLORIOUS COLORS. Now at this point I’m sure she had to think I was losing concentration, because when I saw what had happened, I immediately stopped and commented how beautiful the rainbow was. I then silently prayed thanking God for His sign of promise and love for us. I then explained to her how much I care for her unconditionally with words that I felt were given to me by God. As quickly as the rainbow appeared and the clouds parted, it disappeared and it began to rain again. We finished our short meeting and parted ways, but not without her knowing exactly where I stood. I left the meeting a little heart broken because she did not say anything, nor gave me any indication of her thoughts. But, its ok, because the warmth of love I felt from seeing that rainbow placed there by God himself as a sign of His promise to us more then made up for it. What are the odds? Come on, who could even fathom that out of all the places, all the times, with me driving 25 miles out of my way, that at that exact moment, where I sat, the clouds would suddenly part and a rainbow would appear. Not even the most educated and talented scientist, meteorologist, astrophysicist could have made or predicted this would have happened, just for the clouds to gather back up again. Only God Himself is capable. This was just one more reassurance in my mind that God is in control, and that no matter what happens, He will take care of everything, saying…”Just trust me”. We are here for your spiritual success! Previous post: What Does Blasphemy Mean When Used In The Bible?